The ball has to go into the net and you need to get it there from a kayak whilst your opponents chase you. It’s wet, it’s fun and a bit hard, but at the same time it is utterly impossible not to get carried away by the mood when the game is on. There are 6 competitors (3 against 3) so everyone can be a part of the game and be active. The instructor draws up a tournament so everyone has a chance to play each other. 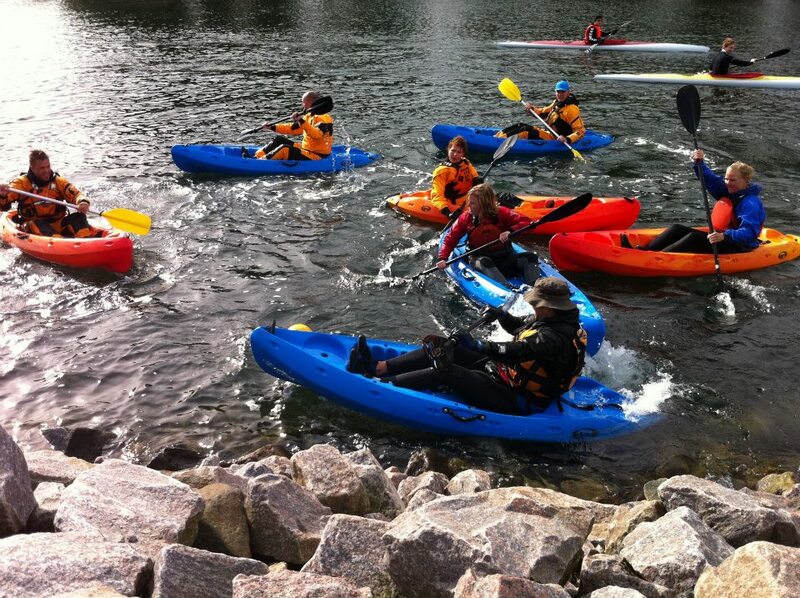 Kayak polo is played in sit-on-top kayaks, so it is easy to get in and out of them if you tumble over in the water. Who can participate? Everyone can participate. No experience is necessary. However, you must be over 12 years of age. Safety We place a great deal of focus on safety when we are on the water and therefore all persons must wear an inflatable vest during the entire event. Alcohol KajakOle’s personnel reserve the right to reject inebriated persons from participating in the game. A rejection does not entitle a reduction in price. Liability Kayak polo is played at your own risk, but there is always personnel with lifeguard training present. What you need to bring along with you Don’t forget to bring your own bathing trunks, bikini or bathing suit. If you have your own wetsuit, then please bring that with you too. Remember to have a change of clothes and warm clothes with you for after and possibly during the match. Shower and changing We have our own shower facilities and changing rooms available. Cancellation terms: A deposit is not paid, but in case of cancellation less than 30 days before the commencement of the activity, half of the price for the event is paid as a cancellation charge. With cancellation less than 2 weeks before the event, the full price is paid. Changing the time for an event less than 1 week before the commencement of the event, costs DKK 375 in administration charges. Cancellation on the part of KajakOle: When you play kayak polo you get wet anyway, so a summer shower does not make any difference. However, with storms or lightening and thunder and if the instructor evaluates that it is irresponsible to carry out the activity, a credit voucher is given that can be used later in the season. Payment and price: We prefer payment through our website via booking, we can also send you an invoice. The price includes everything: wetsuits, inflatable vests, umpire/instructor – as well as effective time with us. Season May 1st to October 1st – can possibly be extended if the weather is good.